While this isn’t a scientific analysis these charts may show you a pattern of similarities to your situation with gambling addiction. 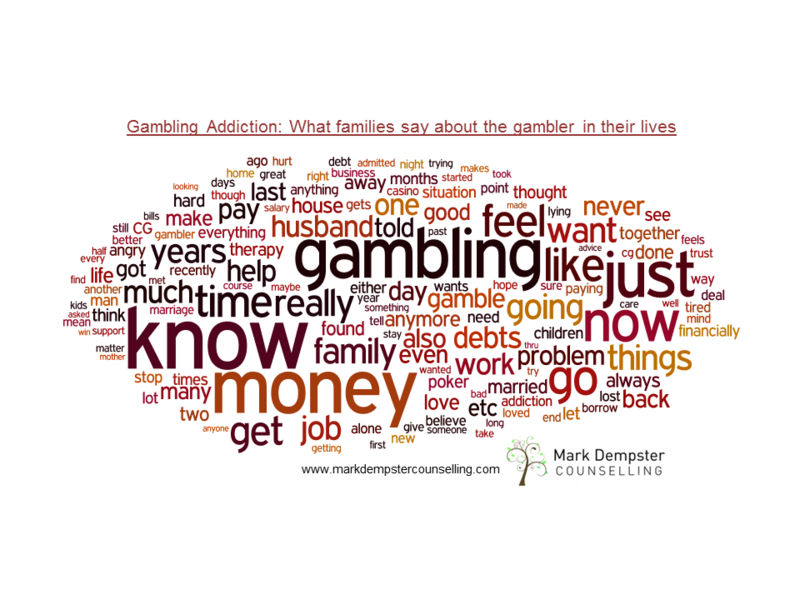 Whether you are dealing with gambling addiction or are a family member or friend who has a problem gambler in your life, see how these words relate to your own situation. Let us know in the comments your thoughts. 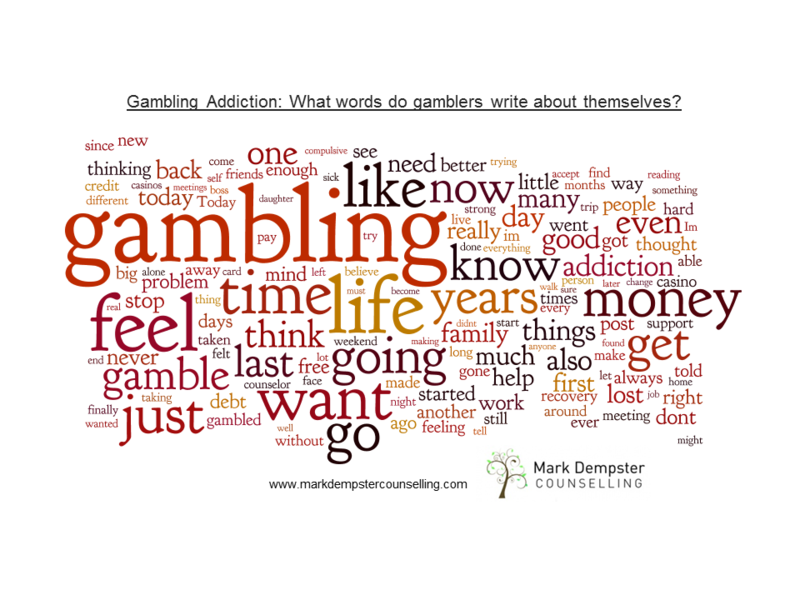 I’ve created these word clouds from gambling addict’s online journals and addict family/friends postings in forums about the gambling addict that is in their lives. This is an anonymous collection of texts and put into a system that highlights the words which come up most often. The individual words paint a picture, even without context, and for those dealing with gambling addiction will see connections between the words as groups and sentences pop out. The centre of the picture has three similar words together: time, life, years. The gambling addict tends to have a long stretch of addiction before they seek help, the slippery slope usually starts off manageable and builds slowly to unsustainable amounts. There are a lot of action words, desires, and people mentioned. There is guilt of their past and a hope that they can make the future better. This cloud shows to me how important it is to unpack an addict’s history and work on creating a real foundation that an addict can look forward to a happier fulfilling life. This cloud breaks down through finance, trust, and people. The financial instability is causing stress and anxiety, words like debt, job, money, house, and pay; show people who are very worried about their security. Perhaps seeing accounts drained, or having collections calling and visiting, their lives are subjected to daily uncertainty. The trust words usually are connected to the feeling words in the forums, money is an important aspect of gambling addiction but the relationship dies on the lack of trust. It causes anger, hurt, tiredness, and the many instances signal the continuous disappointment of broken promises. The people mentioned are more skewed towards men and husbands whereas we know many women and wives are gambling addicts too. Here might be a bias in the clouds as women might be more vocal online and seeking community support. Did you find similarities in the word clouds with your situation? Let us know what you think in the comments below.